The water is turquoise and crystal clear, small fishing boats are swaying gently in the waves and the shoreline is adorned by colorful wooden fisher huts beautifully illuminated by the rising sun. 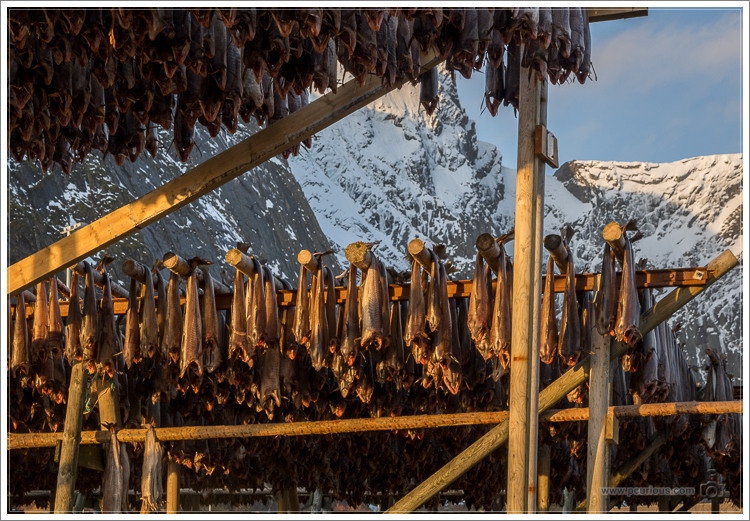 Behind us cod is hung up on wooden racks for drying and rugged mountains rise steeply hundreds of meters and their snow-covered peaks glow orange in the warm light. The scene is so perfect, it looks like a postcard and immediately captures your heart. But Why Travel So Far North In February? The last 4-6 weeks of winter are the best time to observe northern lights: they are stronger in winter, the nights are still long and dark, but the probability of clear skies is higher. After the 6-week-long polar night the sun reappears in mid-January and stays above the horizon noticeably longer with each passing day. By the end of February the days are over 9 hours long and four weeks later they reach almost 14 hours. So February is the best compromise of days that are long enough, but without you having to wake up at 3 am to photograph the sunrise. Due to the Gulf Stream, which also passes along Lofoten the entire coast is ice-free and the average winter temperatures are above freezing. This is very pleasant compared other areas of Norway (up to -40 °C), especially when you are planing to be outside and waiting for polar lights in the middle of the night. For your and for your camera. Wintertime is the fishing season at Lofoten and besides tourism (in summer) the inhabitants earn their living from fishing, so you find cod drying racks everywhere. After 4-5 months the fish loses almost 80% of its weight and goes to Portugal, Spain and Italy. 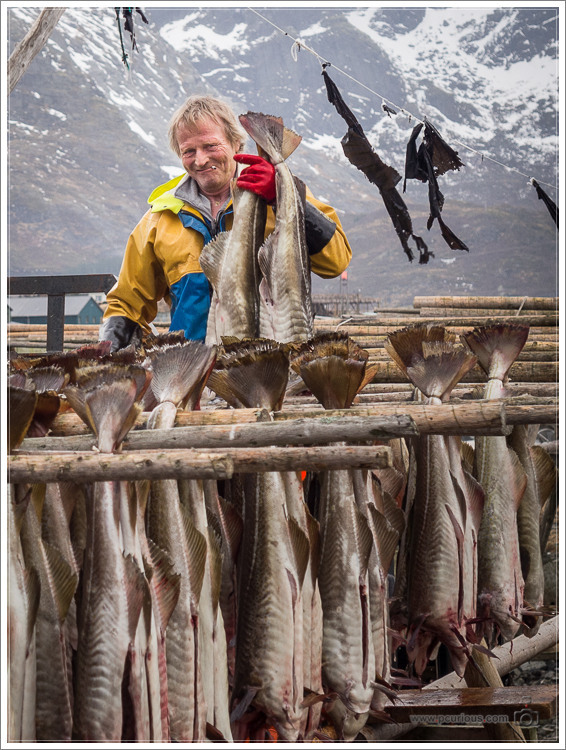 I also learned that there is a difference between stockfish (fresh fish dried by cold air and wind on wooden racks) and clip fish (salted fish dried on rocks on the shore). In the winter months you are bound to come in contact with the fishermen or with the ones preparing or hanging up the fish, and there offer some exciting photo opportunities. The tourist season doesn’t start until May, so in winter you pretty much have the place to yourself. You still have to share the best spots with a few other photographers, but it’s nothing like summer, where the small towns and narrow streets are full of visitors. Last but not least, the aforementioned snow-covered mountains can only be experienced as such during the winter time. 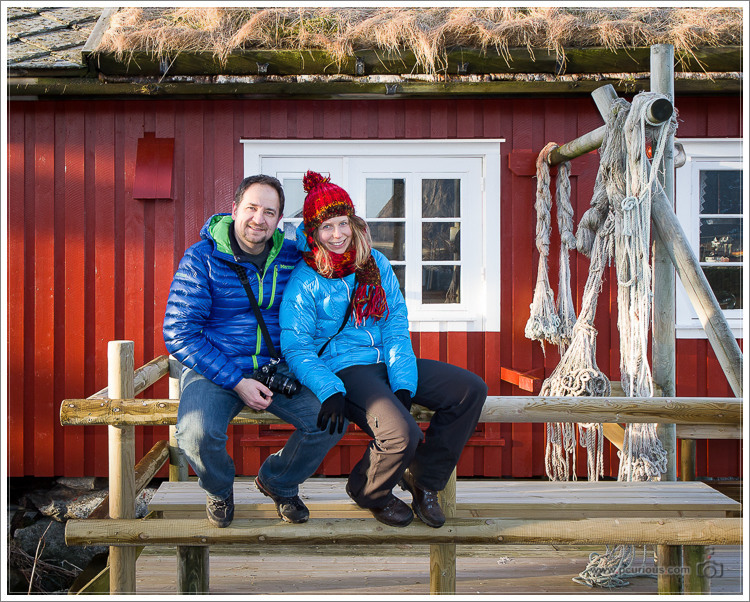 What to See in Lofoten? 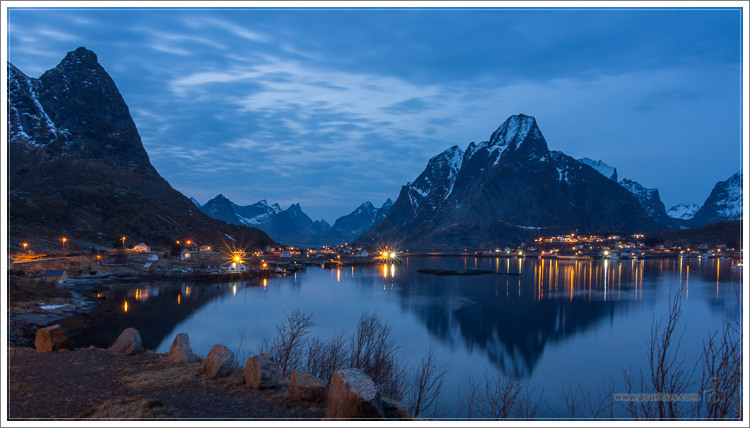 Situated at the entrance of a fjord and surrounded by impressively high mountains, Reine is undoubtedly the most beautiful town on Lofoten. 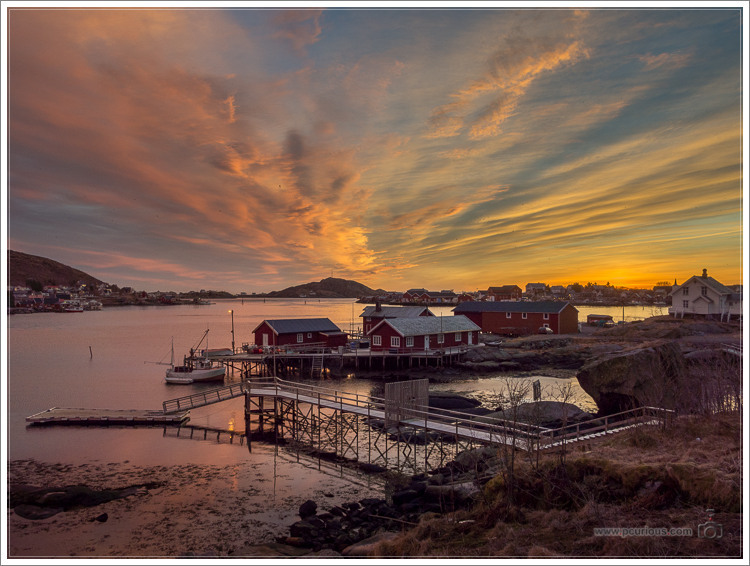 Also worth a visit are Henningsvær, Å, Sund and Nusfjord, and make sure to also explore Hamnøy, Sørvågen and Tind. 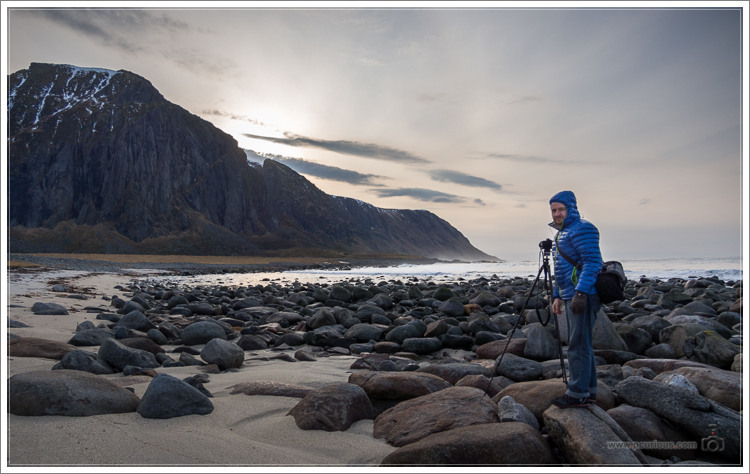 For the beaches Eggum is worth a visit due to the brilliant mountain scenery and huge boulders spread all over the beach and making good motives especially at sunset. Unstad and Utakleiv are also surrounded by rocks and might be of interest for nice sunset locations. 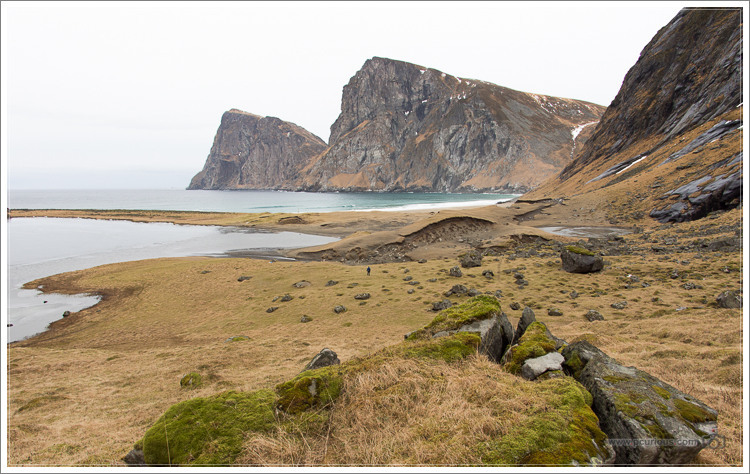 If you like hiking and are a bit of an adventurer one beach that you shouldn’t miss is Kvalvika. Set deep in a broad bay, a ring of high mountains surround Kvalvika. At high tide the beach is separated into two parts. To get from one to the other you have to use chains and ropes to get across the large boulders. The beach is not accessible by car, so be prepared to walk for a few hours on a small trail that is mostly muddy, slippery, partly covered with ice and partly invisible, but the general direction is always clear. During the winder time spikes will make you feel much more comfortable on this terrain, and you will have to climb over various rocks. But the destination is definitely worth the effort and on the way you will pass several frozen lakes and other beautiful scenery. 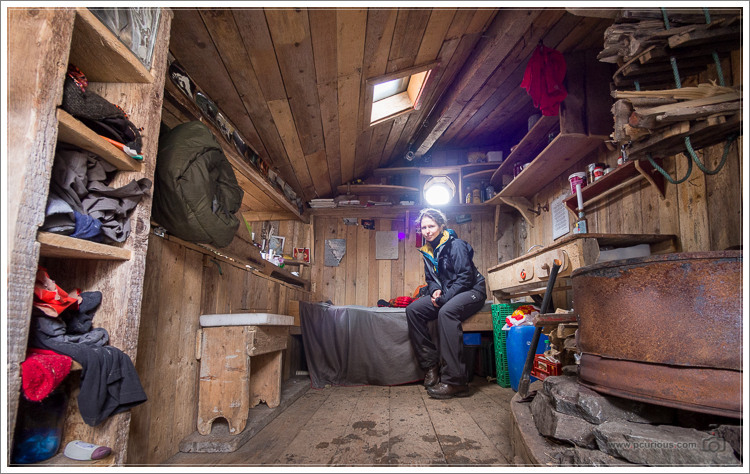 That hike (including the hut) was quite a highlight and will make the trip even more unforgettable for us. 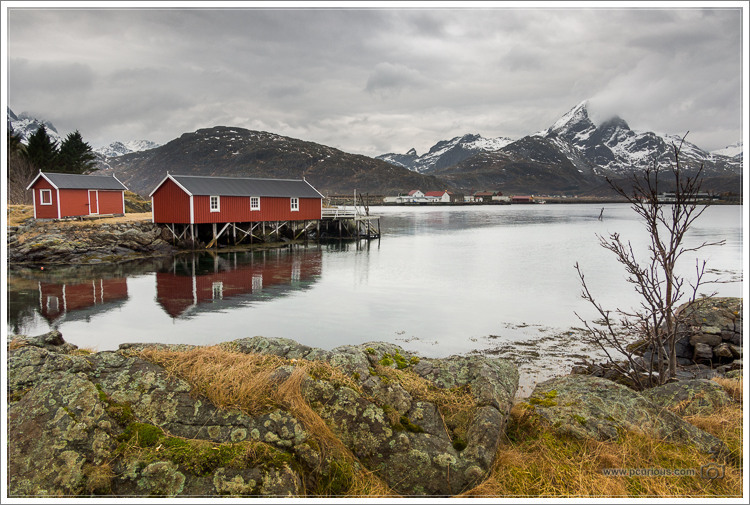 I will never forget the cute wooden fisher houses (called rorbuer) and the landscape with its hundreds of islands, fjords and high mountains as well as the clear water and the fresh air. I would love to come back and hike to the top of some mountains for spectacular views over the archipelago and for a better chance to experience Northern Lights. The image below might look impressive, but it was raining, the lights were only visible for short moments whenever the clouds were nice enough to open up and the colors look much more intense in these 30-second exposures than they looked to us. 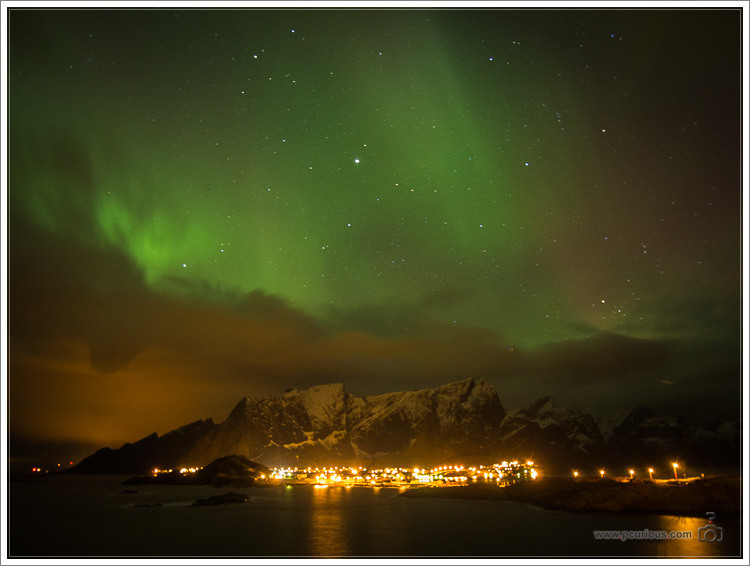 Lovely set of photos from the Lofoten.